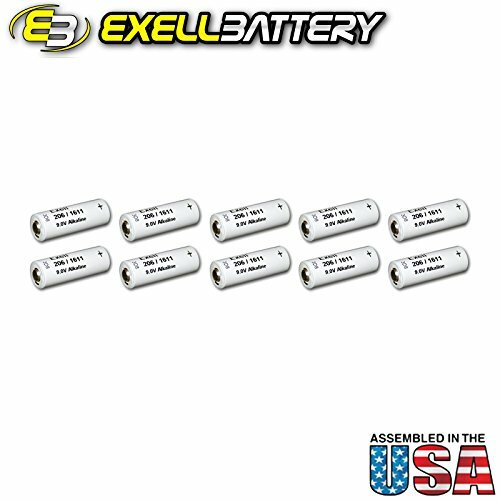 Exell 206A 9V Alkaline Battery NEDA 1611 Eveready 206 Replacement Exell Batteries not only provide consumers with high efficiency, long-lasting performance, they also function as replacement batteries for an array of common and unique applications. Ranging from vintage camera equipment to sophisticated medical testing equipment, Exell Batteries can meet the needs of all consumers.The 206A, or A1611, battery is Alkaline and cylindrical. It is more or less the same length as a standard AA battery, but fatter. It produces 9 volts and is the perfect replacement for the hard-to-find Eveready 206.• Type: Alkaline• Voltage: 9V• Amperage: 110mAh• Length: 50.8 mm• Diameter: 18.6 mm• Terminals: Flat ContactsAlso Known As:NOT COMPATIBLE WITH THE Nakamichi CM300... 1161M, 1611, 206, 6MR9, 7MR9, A1611, B206/L6, E126, E-126, ER-206, H-6D, H-7D, L6, M-1611, MR9, TR-126, TR126, VS32Additional Note: The 206A successfully replaces Mercury versions denoted as 9.45 Volts (H-7D, 7MR9) and as 8.4 Volts (E126, H-6D).Battery Model 206A fits the following products: Manufacturer Model ARVIN 61R39 MAGNAVOX AM-80 SONY C-74 MICROPHONE SONY C74 MICROPHONE SONY C-76 MICROPHONE SONY C76 MICROPHONE Notcompatible with the Nakamichi models.SpecificationsBrand: Exell Output Voltage: 9.0V Amperage: 110mAh Length: 50.8mm Diameter: 18.6mm Country of Manufacture: U.S.A. Not compatible with the Nakamichi microphones.